Myth: A Creation Story - ARTE AMAZONIA provides a global voice through art for the indigenous cultures of the Amazon. In the past few decades, the Piaroa culture has nearly vanished. They are famed for their peaceful society and lack of hierarchy in their social structure. Their traditions and culture remains much of a mystery to us as little has been recorded. However for those with a genuine interest in Piaroa culture, the research of Joanna Overing, maybe of interest. We are grateful to her work and devotion to this beautiful culture. Please visit our Shamanism page for more information about the Piaroa culture. The most important Piaroa ritual is the Warime. It is a fertility ceremony practiced every three years. For this ceremony, the Piaroa summon their mythical ancestors. They make sacred objects like the masks shown, musical instruments, and special clothing. The masks represent the báquiro, the white monkey, and Re’yo (the evil spirit of the bee). The Wrime is a complex ritual and ceremony which symbolizes the origins prctica the world with a return to the days of the beginning of mankind, to be inserted back into human activity with strength and vitality. It is usually performed once a year to celebrate the abundance of crops alimentaciny and its celebration depends on the decision of Viejome-chamn ruwa or principal, based on the physical conditions and spiritual power needed to run the event and in the dreams and visions he experiences in this regard. The Me-ruwa is the owner of the song, directed rituals and assumes responsibility as the Owner of the party: the organization and invites the entire community Piaroa. The Me-ruwa knows all the myths, leads Wrime actions, knows the meaning of clothing and the sounds of instruments, as well as how to prepare and can drive social actions in their community. A Me-ruwa Wrime organized with the assistance of a WHO Dzuww or Meri, who are the masters of breath. The Me-COOPERATION ruwa Meri and reflects the work of the heroes mitolgicos. The brothers singing Wahari-the-creator of the phenomena of the world and Buoka-blowing, the great magical power Meri holder who defends against the forces dainas Piaroa invisible. The combination of the two specialists, Me, and Meri, can adequately perform the ritual acts and the community ensures a protection against supernatural influences constant and destructive for the lack of the festivities. The Wrime in addition requires the participation of men and women to fill all the requirements in order that the party can continue during the perodo stipulated by the leaders, which can last from one to three months. The Wrime summarizes the rituals and ceremonies relating to hunting, recolecciny socializacin the Piaroa, it is an activity involving members of surrounding communities, including preparations for the party. The celebration is governed by a concepcinmtica which is located in Mo tempore is, in the origins of the world. The characters are more highlights of Wrime Ojwodae, representing the Tapir-anaconda, a sort of ancestral mother; Buoka, represented by the deer, the son of the ancestral mother, and a kind of andrgino, WajariOjwo, tapir, culture yhroe creator god, whose voice est represented by thunder and Tchejeru, Wajari sister, mother who descended original wild pigs or jabales. Masks for Warime Ceremony are used by men during the celebration of Warime. Materials used are mamure, hexagonal fabric, which is covered with bark cloth marima and wax. The decoration is painted with annatto with pendare. The frame is adorned with a mane of moriche, approximately 60 cm. long, covering the face and neck of the dancer. The masks are worn on the head with his trunk up. At the tip of the snout are two holes through which passes a wire Curauá, whose ends pendern piapoco feathers (Toucan), colored yellow and red. Women during their manufacture can not see its preparation, at the risk of receiving any other harm. There are several types of ceremonies Warime: the Ime Wrime in which three people involved with this kind of masks, the Mkir Wrime involved in the Wrime five dancers. The masks carried on this occasion they differ from earlier in these Tv shows that the tube is more pequeay represents chcharo (ms Pequeo bush pig, appear to be females) while the former have the tube long and mimic ms bquiro (male and pig tusks, boar). Both characters, of course, have a different onomatopoeia, according to the animal it represented. There are also the Ybku Wrime and Wir Wrime this last executed by the Mako, subgroup Uwotuja or belonging to the same family Piaroa. (Note: Both the chcaho as bquiro, both are wild pigs or bush). 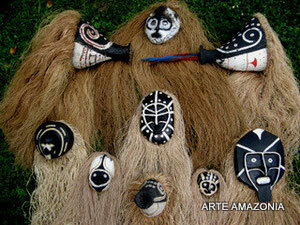 The Warimesa (dancers) can be replaced by others, who colocarn suit and mask in due course in the ritual.